It’s a heatwave. The temperature is in the upper 20s which means that British men flock to the beaches and strip off as much as they can get away with and still stay legal. 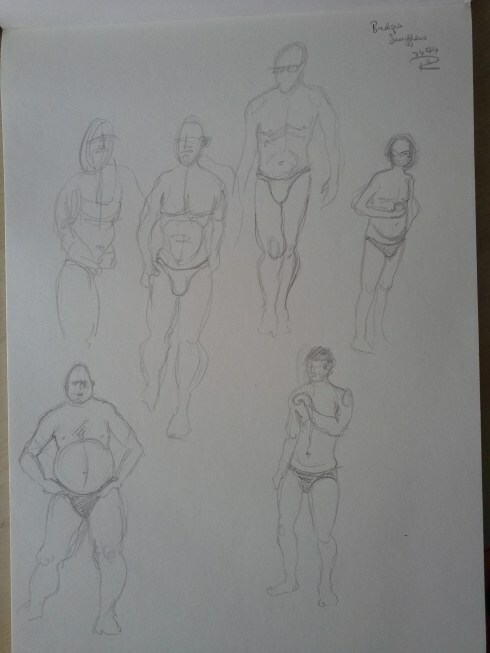 I’m working in my Daler Rowney A sketchbook with a Derwent sketching pencil size 4B. 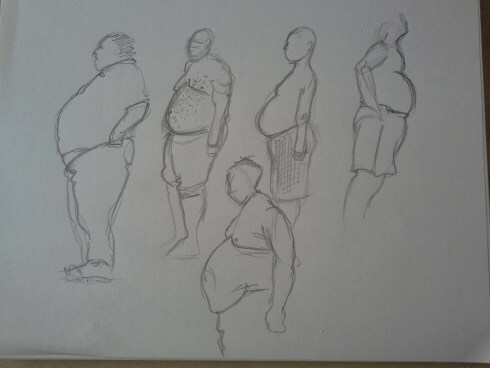 So much male flesh on show, some men obviously take pride in roasting their beer bellies and moobs in the midday sun. And unfortunately, Budgie Smugglers didn’t go out in the 1970s. Thinking of ideas for some interesting demo blogs. Have a great little line-up Then, what I thought was the easy part became more of a challenge. Wanted to insert a few short video clips. HAH!! Haven’t been near my video stuff for a few years. Was using a Flip video Ultra HD. Does the trick. Obsolete, of course, but workable. Kind of. Some battery charging issues. Then there is no clear trail of breadcrumbs linking Flip to Itunes to IMovie. Re-inventing the wheel. I am taking copious notes. Should be able to get this together! I am resolute in making old machines give it up for me! Need to add a few VERY SHORT vids to my website. I always look at the time on the video before I decide to watch it. Do you do that? (Unless I really need to see a cute mammal to cheer myself.) So, I actually want viewers to view what I post. Not monopolize their time. 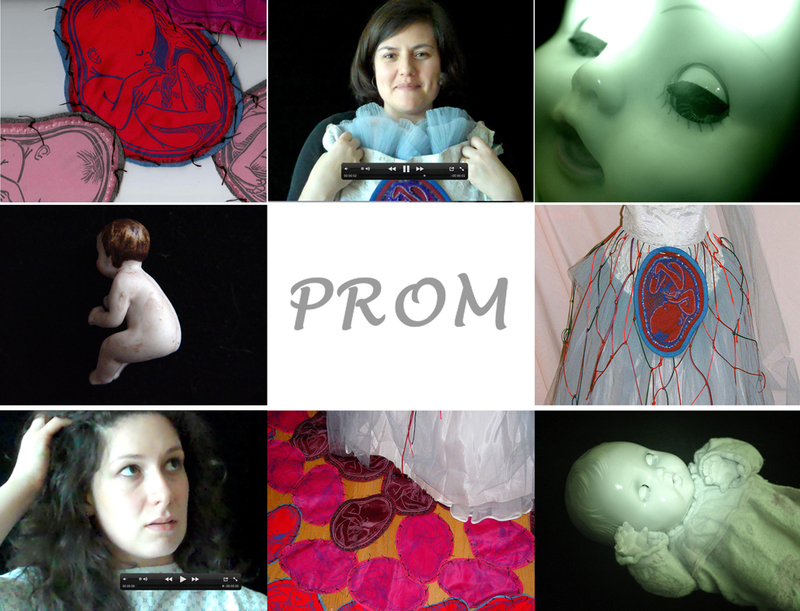 Finally able to edit and publish the live performance of my video piece, “Prom”. May of 2010. Haven’t been able to work for quite some time–so glad to be starting back to my life again! So, there is a long list of “must finish”. This is one of them. I did my first video artwork in 2009-got a chance to have a live performance in 2010. Very last minute-I was lucky enough to have some great actress/improv/artist friends that stepped up to the plate. Learning experience. You really do need some kind of audio/lighting! This was made with a Flip videocamera on a tripod. Not so bad when you consider that. It was a cold reading, without rehearsal. I think the actresses did a super job. Jen Bosworth, Jocelyn Geboy and Courtney Cole Brobst. The performance was at Art on Armitage in Chicago, IL., courtesy of Mary Ellen Croteau, who let me have the use of her gallery space!. Thanks so much for the opportunity. Good to be able to start working again. On YouTube. The produced video version is on YouTube, too. Watch that one first. My cousin, Meghan Stromberg was an actress in the video production. Scarily wonderful! Jocelyn Geboy, a gifted improv performer, took over her part in the performance. ( Meghan was a little too pregnant with her daughter, Sabrina!). 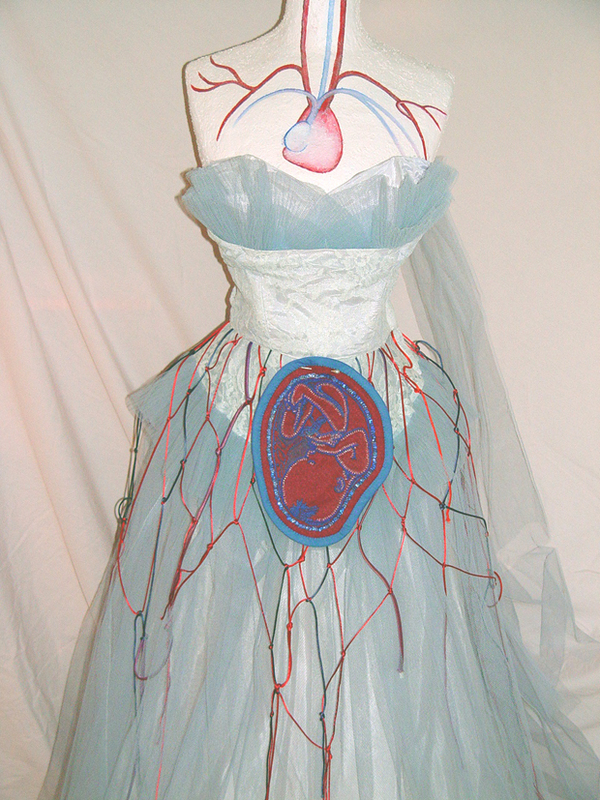 The installation was created with a vintage mannequin and prom dress. 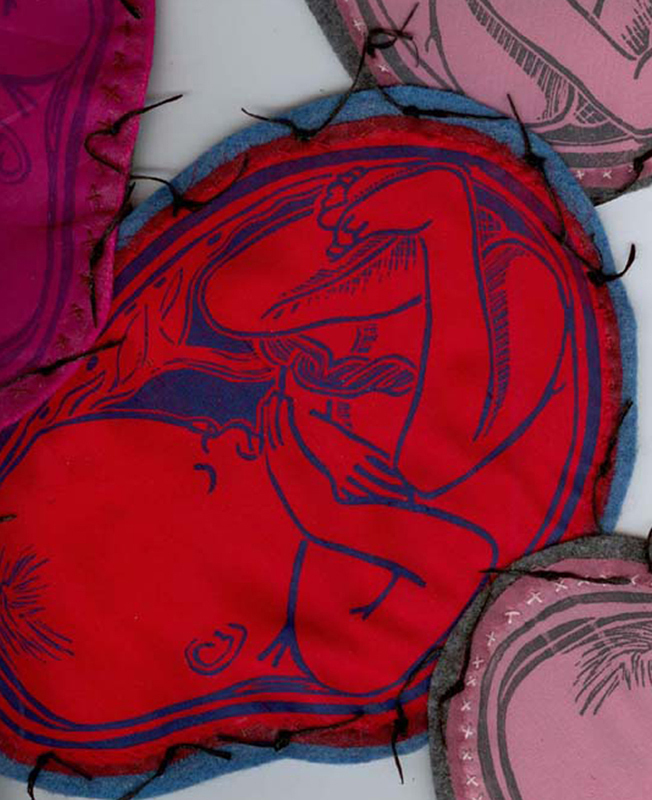 The fetus carpet was made from my original linocut printed on silk, sewn to felt and “sutured” with embroidery floss. About 5-6 feet in diameter. If you are feeling beneficent, would you try to sign up for my mailing list–I have yet to send out a mailing. and you’d probably only receive an email a few times a year. Not a huge obligation. I only would post a seasonal update of shows and such. Most likely. So, here’s the link to my Mail Chimp account-where you can sign up for Hladik-Voss Art. (That’s me!). OR, http://hladikvoss.com/ where you can sign up for my blog and Mail Chimp on the same page. Would appreciate a comment if you did this for me and it worked! Small prizes may be involved. 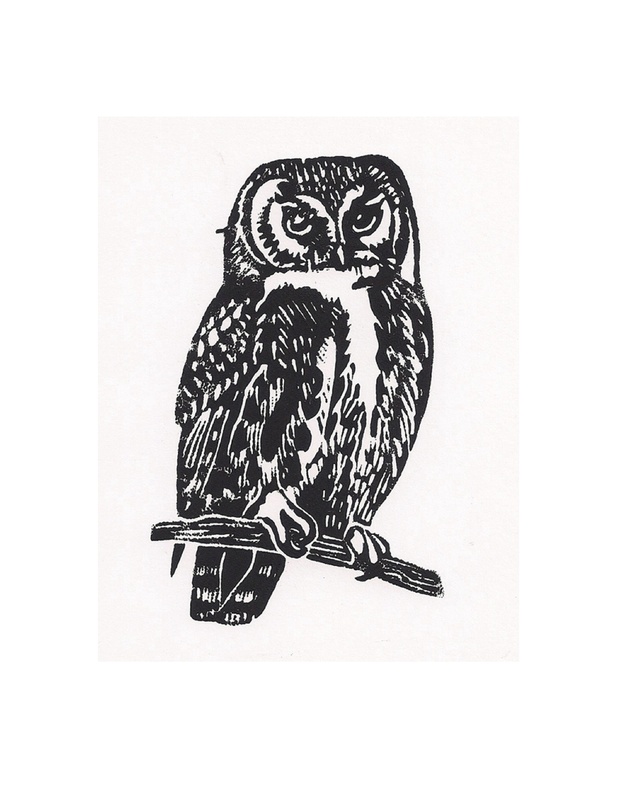 OK- the first 10 people to sign up will get a small original owl linoprint from me-you’d have to give me your mailing address to participate. This Owl is 4 x 6 inches-numbered and signed-colors will vary-blue/green/brown/orange and black. Yoko? Hope you’re having a spiffy day. Started Twitter today on the advice of much more hip, savvy and cooler people. Not being Lady Gaga or Yoko Ono-( more on Yoko Ono later! ), I could not fathom why anyone would be interested in what I ate for lunch. Apparently, this platform can be used for good! Once I establish a nice group of followers, I can tweet my incredibly hypnotic and addictive artwork on a daily basis for the joy, edification and amusement of all. That’s the plan. As a corollary-I am going to try to get the aforementioned Yoko Ono to follow me. I will be doing this in a totally respectful and playful way. 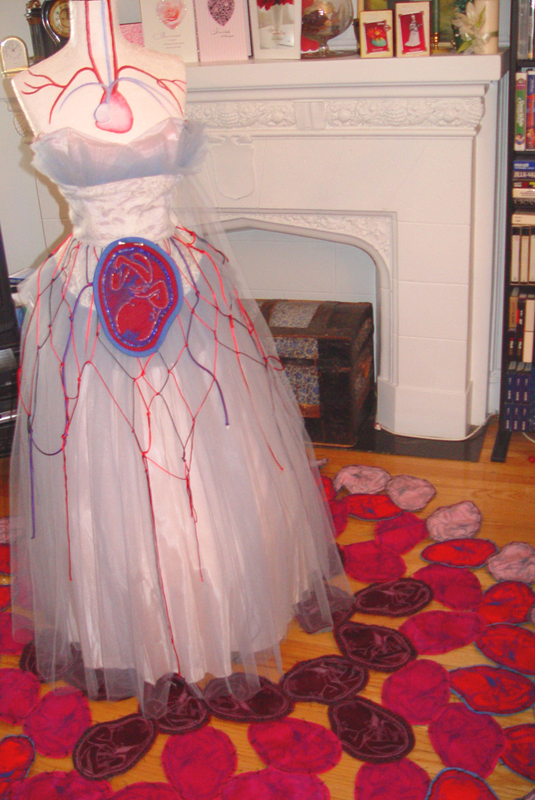 As she has said, in her brilliant conceptual work: “YES”. So why not! From the “It Could Be That Easy Tour 2014. I will use her name in my blog and as a tag word. SO, be in the company of potential greatness and follow me on Twitter. 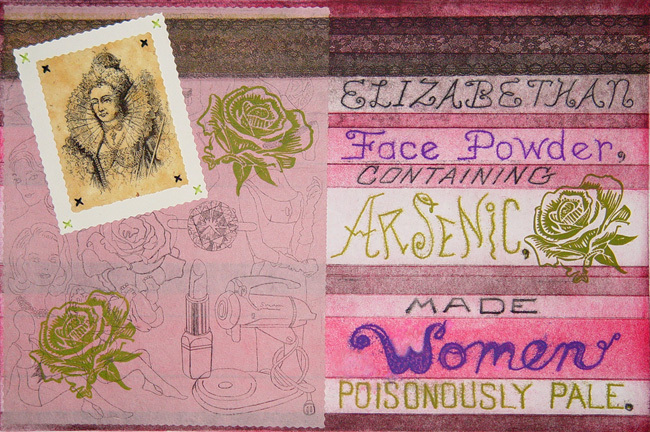 I’m Printmistress88, or Judith Hladik-Voss! Maybe we can all have lunch with Yoko sometime? Last night was the opening of the group show texttexttext @ Woman Made Gallery in Chicago, Illinois. I wasn’t able to attend-but my extremely arty and handsome husband, Richard, went and showed the flag for me. He’s an artist, too, which really helps! I got a great placement for the piece and am very grateful. It turned out really well-and it’s another link in the cosmos! Someday I’ll get the hang of this!